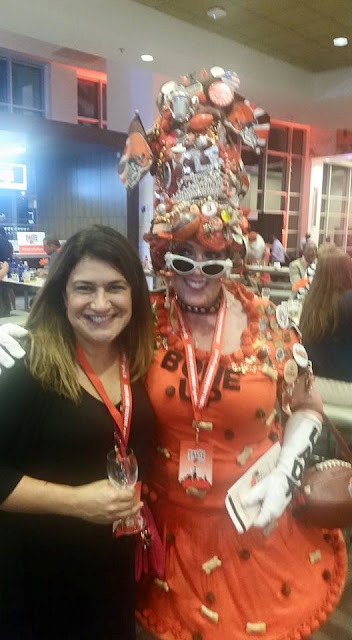 It was another fabulous night as the Greater Cleveland Food Bank and the Cleveland Browns joined forces to tackle hunger in NE Ohio. 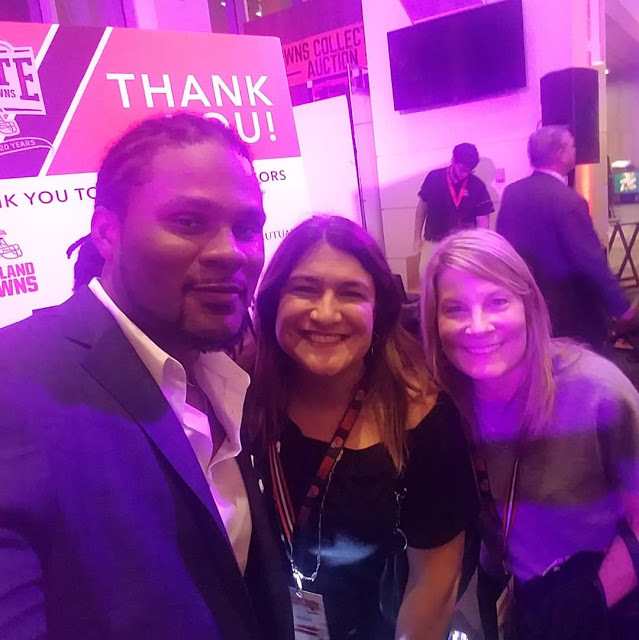 The 20th annual event raised over $260,000!! And thanks to everyone involved, they will be able to provide more than 1 million nutritious meals to those in need. 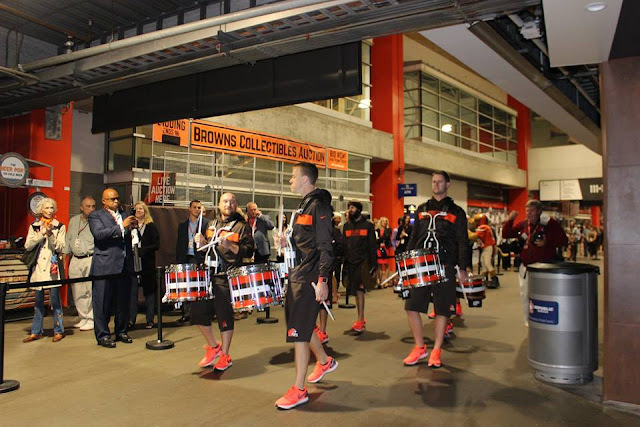 As guests arrived at First Energy Stadium, they were greeted by the Cleveland Browns Drumline. Guests grabbed a glass and headed to the 7UP City Club Lounge. The stadium was decked out for this much anticipated event. 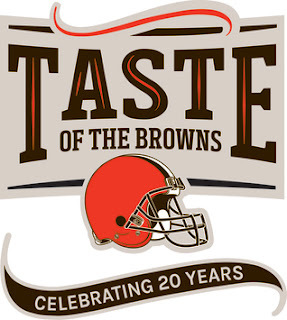 Taste of the Browns lives up to its name and there is a lot of tasting going on. So.Much. Food. I didn't even come close to trying everything! This year, Chef John Selick treated guests to fresh pulled mozzarella served with a pesto infused tomato salad. 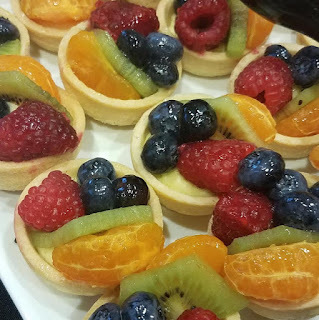 Super fun and delicious too! 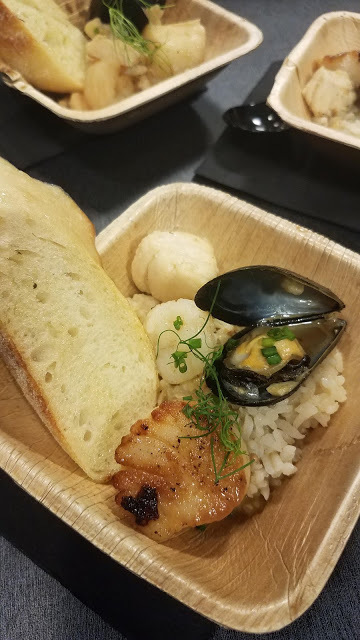 My favorite dish of the night was this seafood packed Bouillabaisse from Lutheran Metropolitan Ministry. OMG. 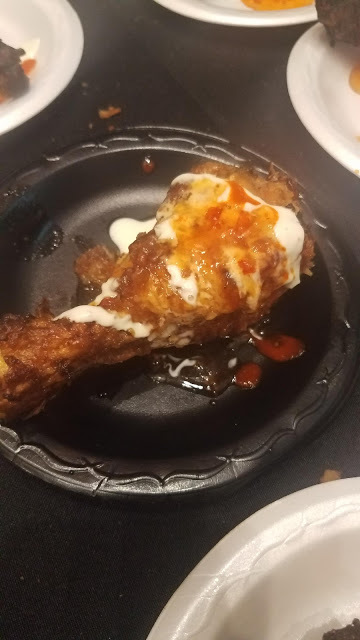 This Korean Chicken Leg from Yuza was delicious but super messy. 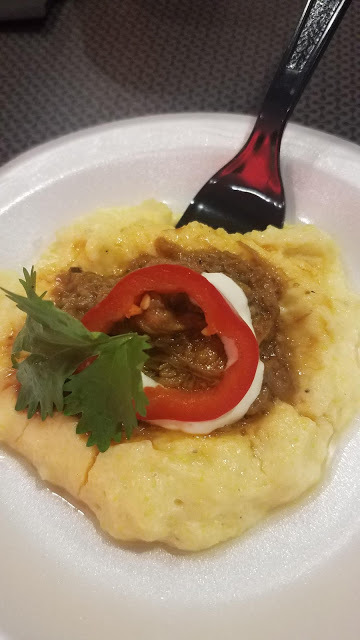 Momocho served a very tasty Las Gachas - Red Chile and Chocolate Mole Braised Lamb with Smoked Gouda Corn Masa, Pickled Chiles and Spiced Peanuts. 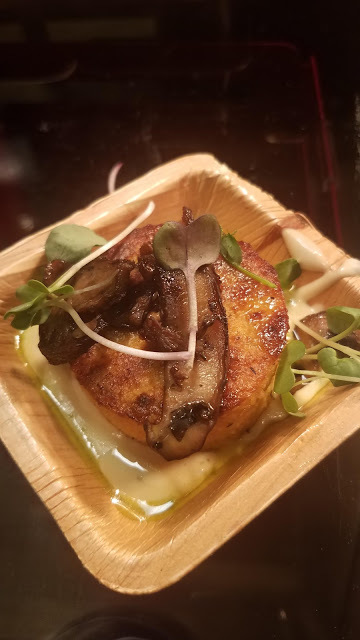 The Cleveland Browns Hospitality Group wowed everyone with this Chargrilled Vegetable Polenta Cake with Gorgonzola Cream Sauce, Crispy Mushrooms and Chive Infused EVOO. 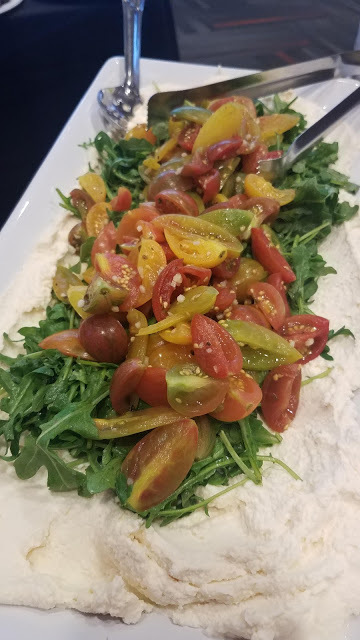 Micelli's pilled arugula and heirloom tomatoes on top of ricotta for a delicious and beautiful dish. I will definitely be recreating this as home with the last of my garden tomatoes! 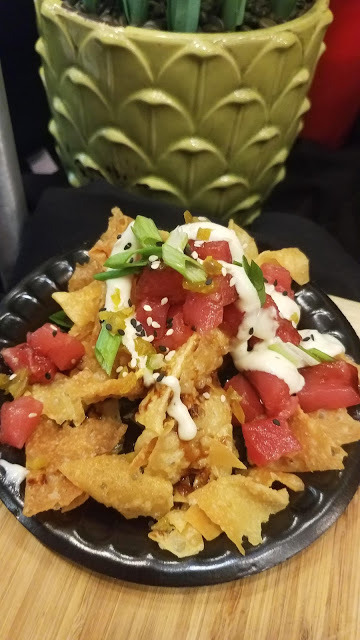 Heck's proved that they do more than burgers and bread pudding with these ahi tuna nachos. 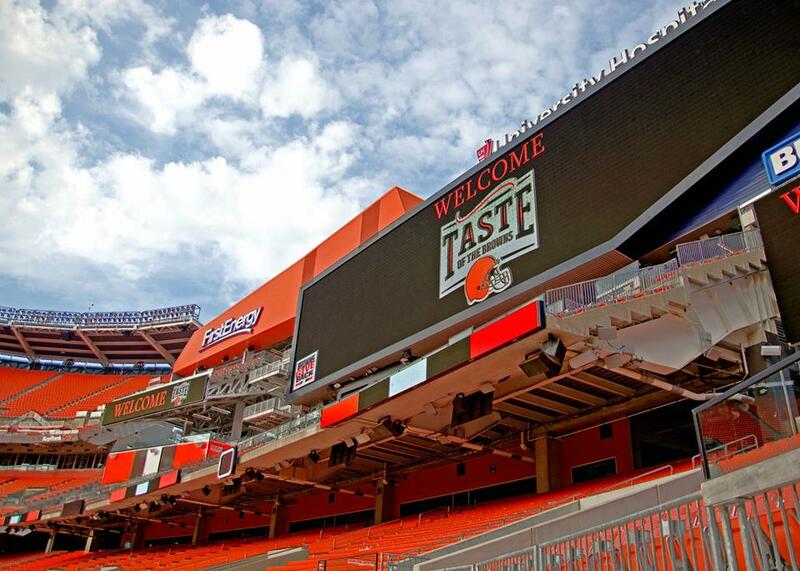 B Spot in FirstEnergy Stadium creates a new burger based on each of the Browns home opponents. Super fun idea! 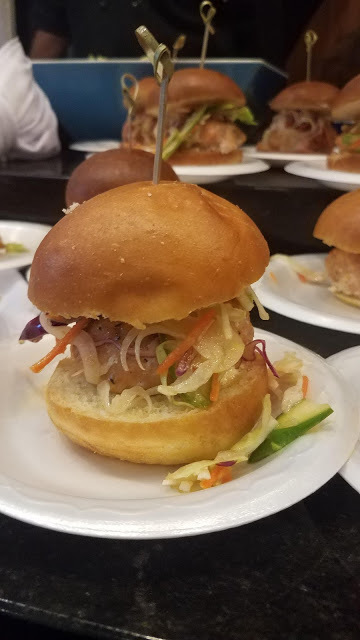 They showed off their creation for the Falcons game at the event - The Georgia Peach Burger - and it was delicious, but flew off the plate before getting photographed. There was lots of beer, wine and cocktails flowing. 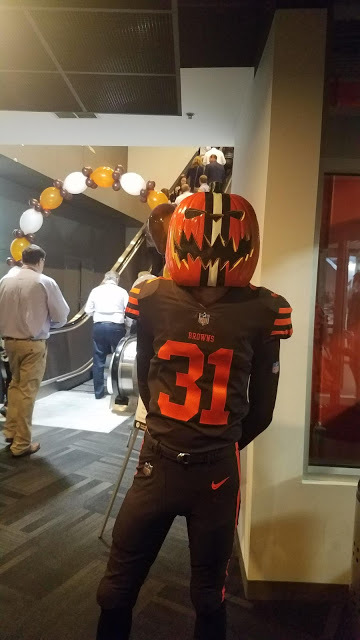 And even the new exclusive cola of the Browns made an appearance. One of the beverage highlights was the Field Goal Float, a boozy combination of Jagermeister, root beer and vanilla ice cream. You definitely want to try this at home. 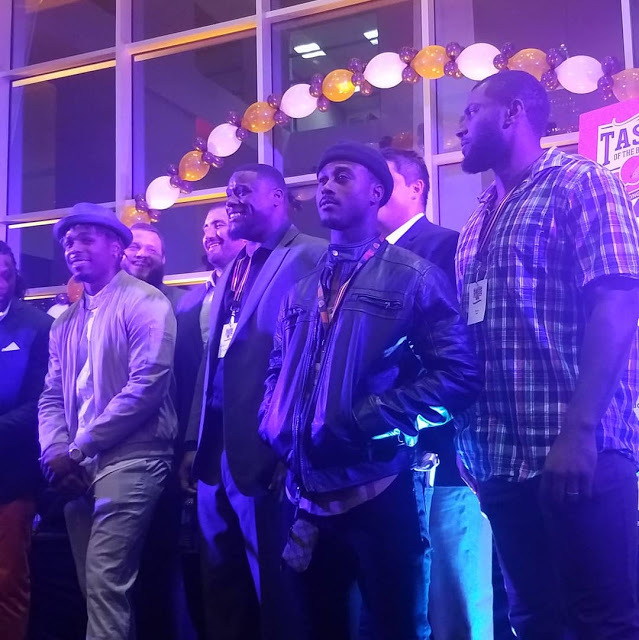 And of course it wouldn't be Taste of the Browns without lots of Browns players! 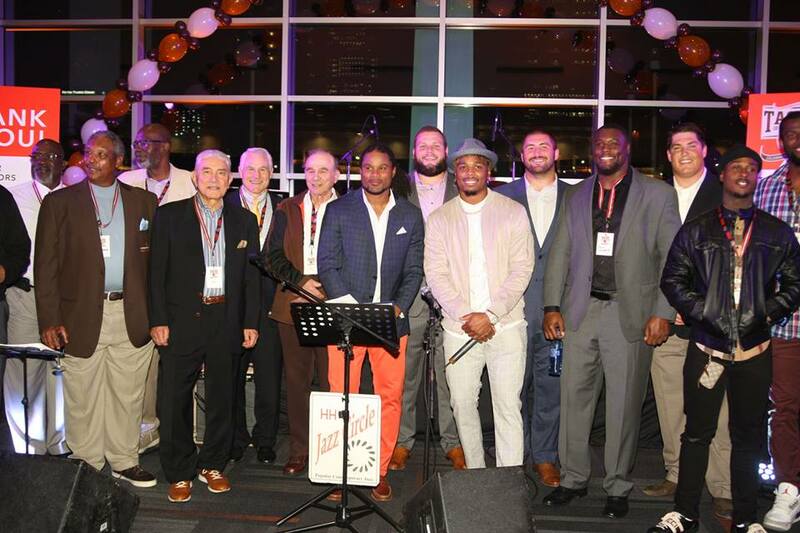 Past and present players posed for pictures and signed autographs including honorary event co-chairs Christian Kirksey and Josh Cribbs. 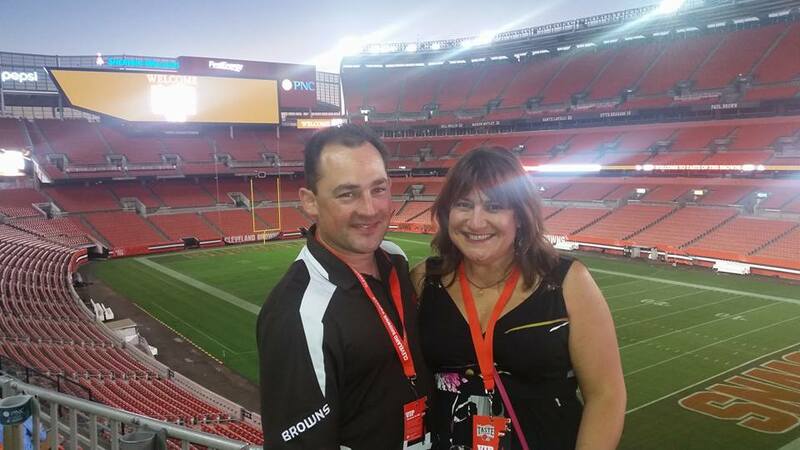 The best part though is all of the money that is raised for the Greater Cleveland Food Bank. Each dollar raised provides four nutritious meals to those struggling with hunger. 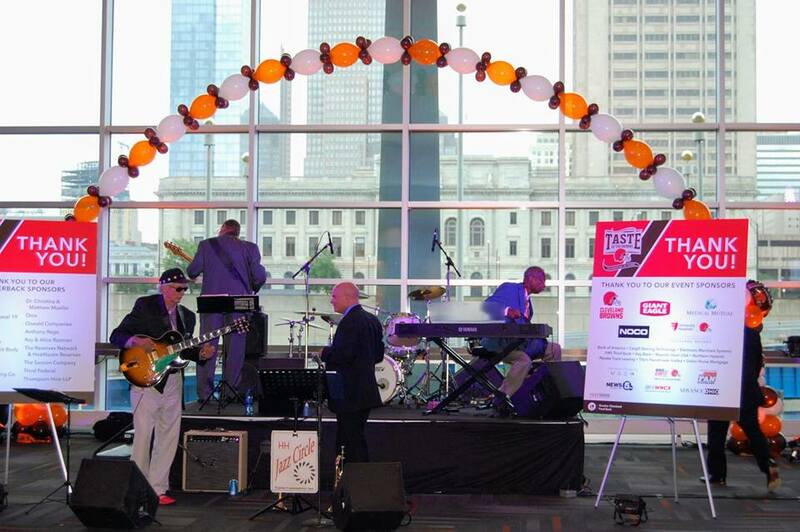 If you missed the event this year, you can still help the Greater Cleveland Food by donating online. You can follow the Food Bank on Facebook, Instagram and Twitter. Summer is almost over but I'm savoring every drop while I can. 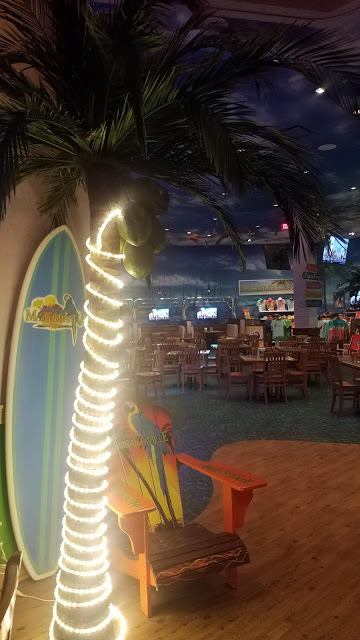 But no matter the season, it's always feels like summer at Jimmy Buffet's Margaritaville! You can get that tropical feeling year round thanks to the waterfront location and nautical decor. Margaritaville is located in the Flats East Bank near both Lake Erie and the Cuyahoga River. Once you step instead, you are transported to a Jimmy Buffet themed extravaganza. 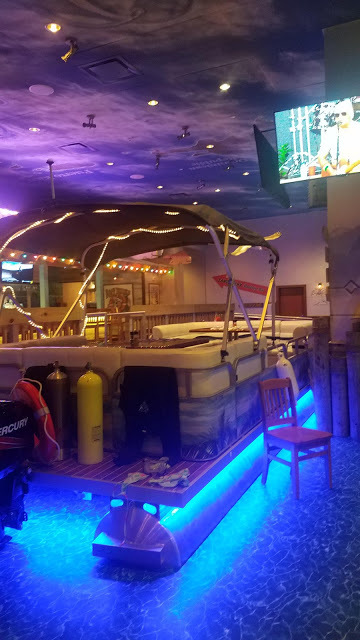 Part restaurant, part bar, and part gift shop - if you are a Jimmy Buffet fan, you will be in Paradise for sure. Thank you to the folks at Margaritaville for inviting me to dine with them. They have a huge blender by the front door that reinforces your need for a margarita as soon as you step inside. Well played, Margaritaville. There are a bunch of different margaritas on the menu as expected but there are also moonshine based cocktails, wine and buckets of beer. I tried both the Watermelon and Perfect Margaritas and the Watermelon was the winner. It was fresh and not too sweet. Note: It doesn't come in a traditional margarita glass. Overall, this is a fun place. Don't expect fine dining - but the food is good and the atmosphere is unique. There is Jimmy Buffet music playing and the decor is vibrant and a bit cheesy, in a good way. My favorite feature is the table that is built into a pontoon-style boat. I love the painted ceiling and the palm trees. 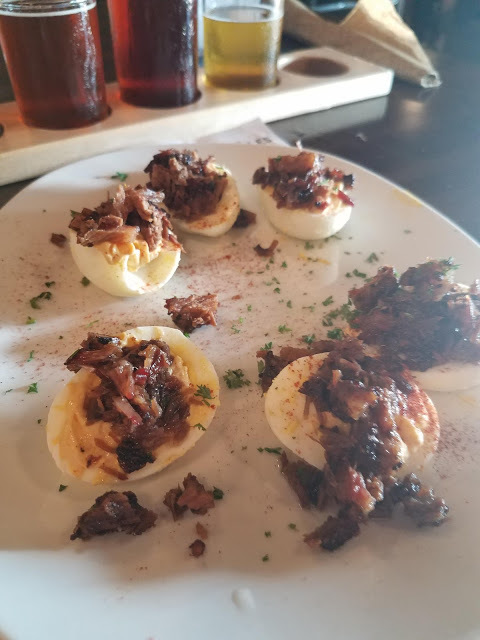 The menu consists of an assortment of bar food, an assortment of burgers, steaks and ribs, and seafood dishes with some salads. Vegetarian options include spinach and artichoke dip, a giant pretzel, salad and side dishes. 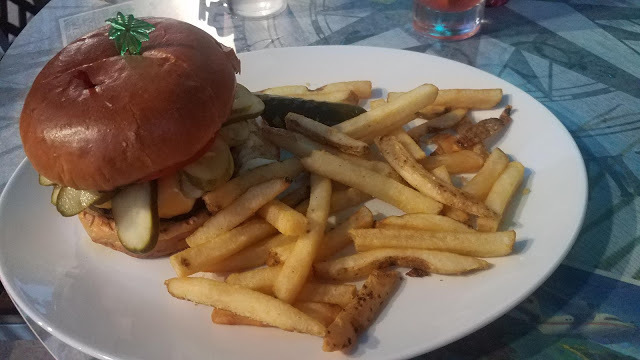 I couldn't resist ordering the Cheeseburger in Paradise: a nice sized burger with American cheese, tomato, lettuce and pickles. I ordered with extra pickles and I was not disappointed. I love that the fries came with skin on them. Unfortunately they were lukewarm in spite of the place being very slow on a Wednesday night. If they were hot, they would have been excellent. I still devoured them. 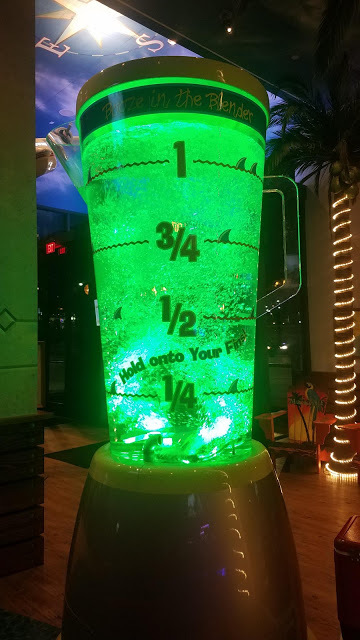 They also have a kids menu that includes fun tropical mocktails served in light-up souvenir cups. 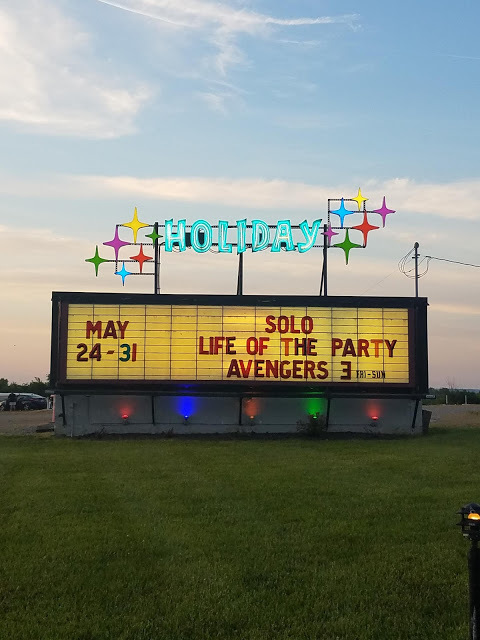 This is definitely a kid-friendly place! They will love all the fun sights and sounds. The rooftop Landshark Bar is supposed to have great views of Lake Erie and have a drink, but it was unfortunately closed during our visit. I definitely want to go back and check that out. 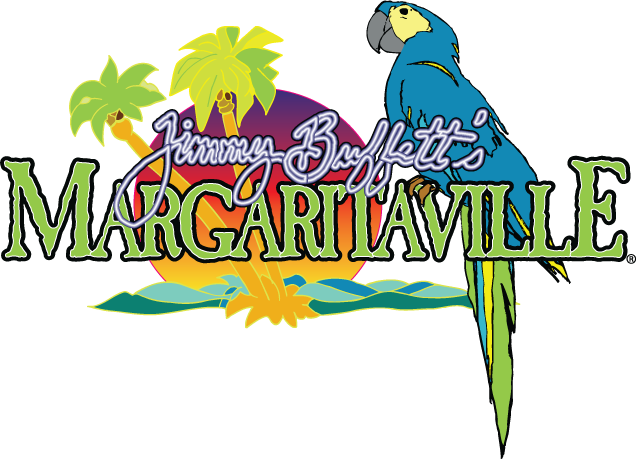 Margaritaville is close to FirstEnergy Stadium and would make a fun place to grab some drinks on Game Day. Wings are even back on the menu! They have lots of TVs so you could watch the game there even if you don't have tickets. 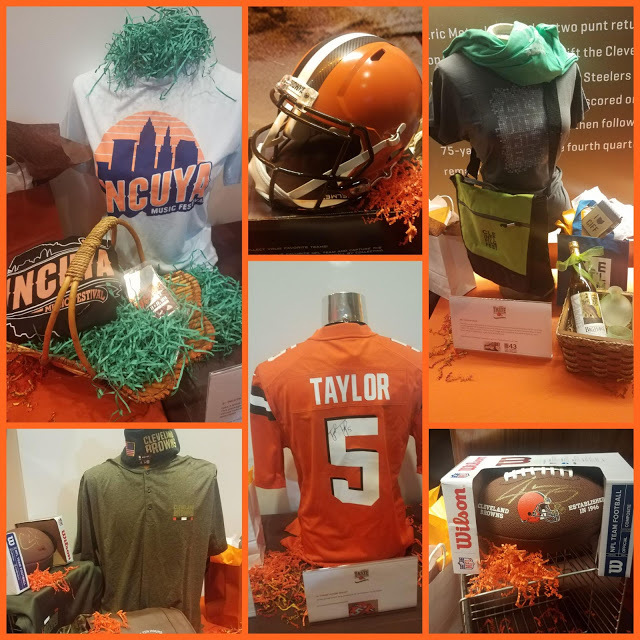 Speaking of football, they have a Fins, Fans and Football giveaway going on right now where you can win a football themed prize pack. And that's not all. 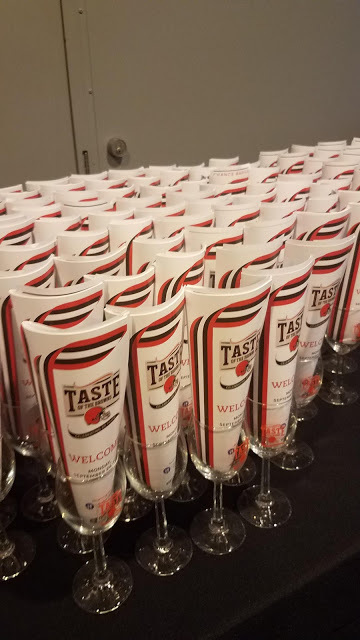 You can also enter to win a $50 gift card right here at Eat*Drink*Cleveland. This contest ends Sept. 30th. Winner will be randomly selected. You must provide a way for me to contact you if you win. 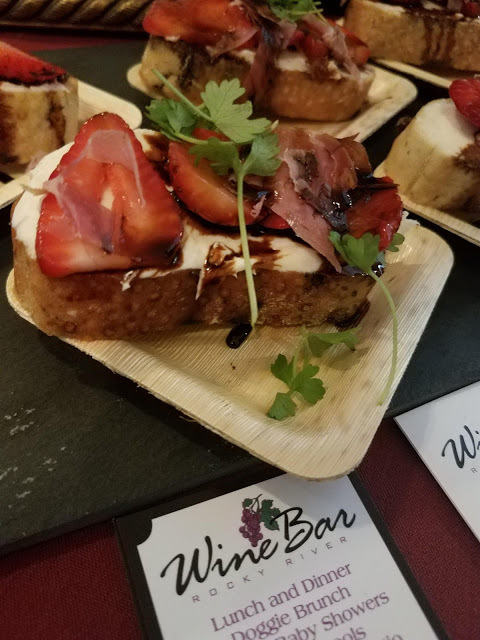 The 21st Annual L'Amour du Vin is a delicious event in Lorain County. 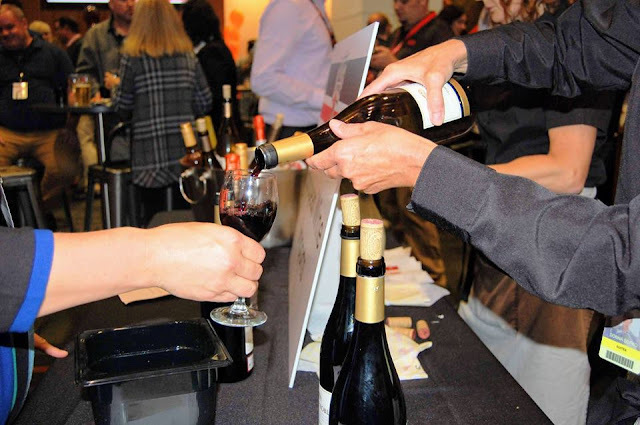 This strolling food & wine event is the annual fundraiser for the Arthritis Foundation. The evening features wines from around the world and cuisine from fifteen of the area's best restaurants. Mark your calendars for this fun evening benefiting a very worthwhile cause. Event proceeds support local programs and services for the nearly 1.3 million Northeast Ohioans with arthritis and fund critical arthritis research. 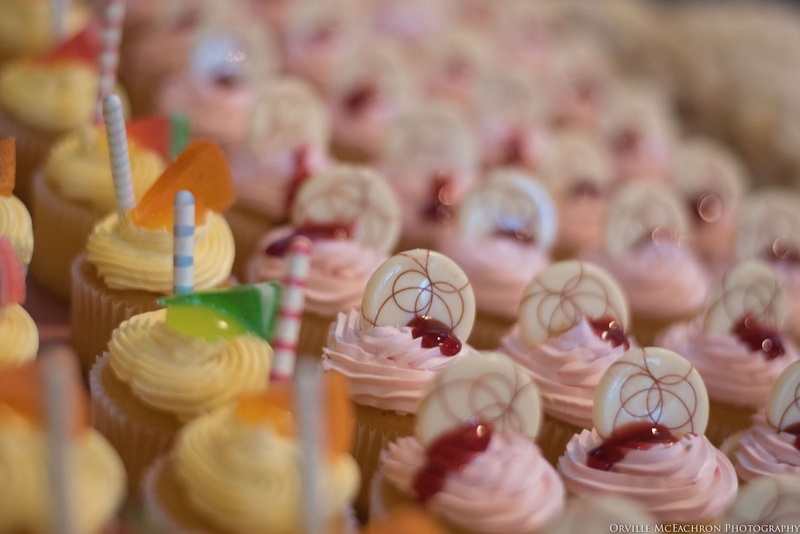 In addition to tasty bites and cocktails, there are raffles and a silent auction. General Admission tickets are $75 + VIP tickets are $95 and include access to the VIP Lounge. You can purchase tickets online and find out more info on Facebook. You can also enter to win two tickets here! Enter using the Rafflecopter below. Winner will be randomly selected on Thursday 9/20. Good luck! 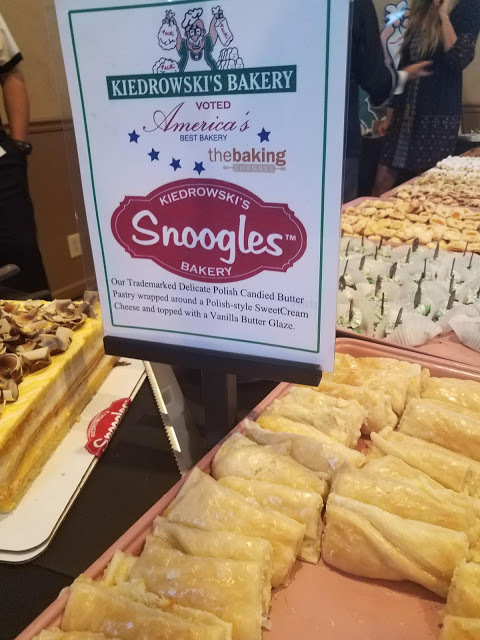 If you've never tried Kiedrowski's Bakery, this is your chance! I first tried their sweet treats when I lived in Amherst. 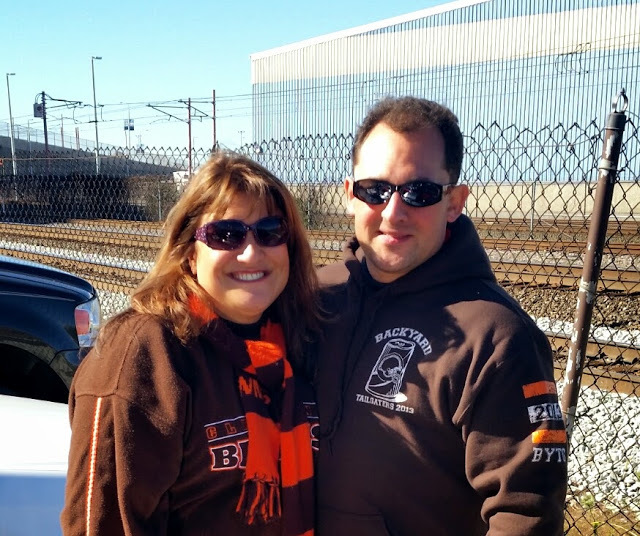 This Polish-American style family owned bakery is an institution in Lorain County. They are famous for their Snoogles, but everything I've ever tried has been great! The Arthritis Foundation is boldly pursuing a cure for America's #1 cause of disability, while championing the fight against arthritis with life-changing resources, science, advocacy and community connections. Follow them on Facebook, Instagram and Twitter. For 20 years, the Taste of the Browns has been helping tackle hunger with the Greater Cleveland Food Bank. 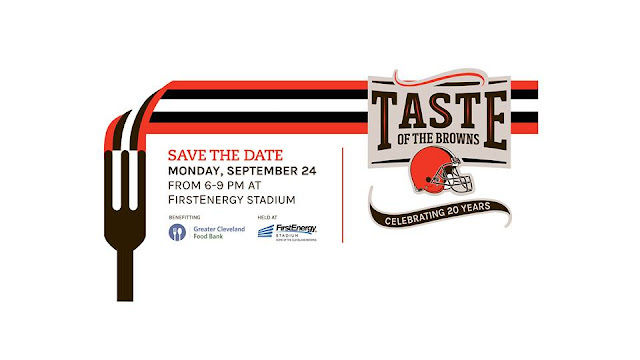 This year, the event will take place on Monday, September 24th from 6-9pm in the 7UP City Club Lounge at FirstEnergy Stadium. It's a great opportunity to get up close and personal with the Browns while helping feed the hungry. 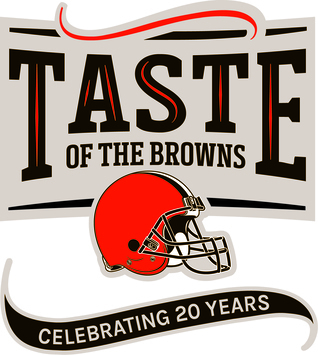 Join the Cleveland Browns and the Greater Cleveland Food Bank as they celebrate Cleveland’s passion for football and our city's renowned culinary cuisine, and demonstrate their commitment to the community. This event truly is like no other! 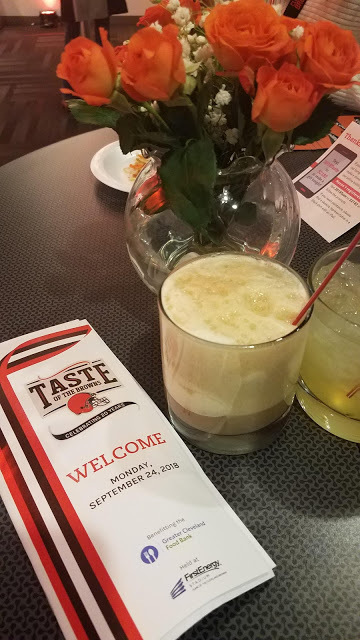 Guests can mingle with former and current Cleveland Browns players and celebrities while enjoying delicious tastings prepared by 25+ restaurants. Wine and beer samples are also included. In addition to eating, drinking and mingling, attendees can participate in the silent auction, live auction and wine + beer pulls to benefit the Food Bank. You can find out more information including a list of participating restaurants. 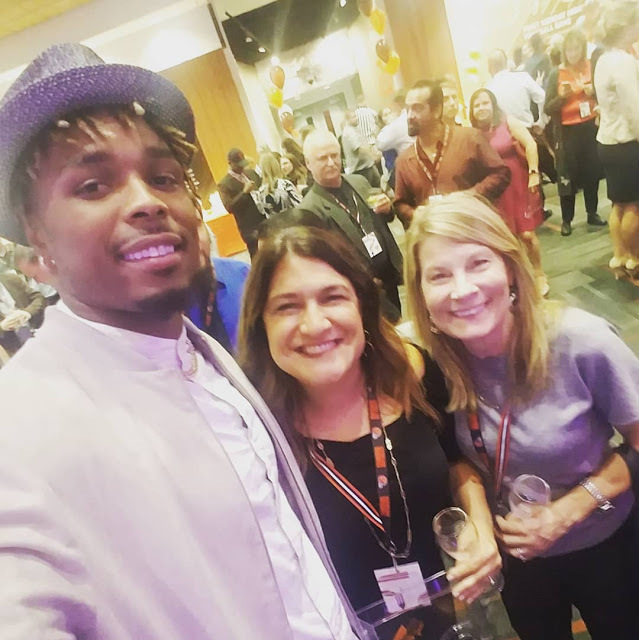 Last year, this event was able to raise $250,000 for the Greater Cleveland Food Bank, which allowed the Food Bank to provide more than 1 million meals to those that need it most. General admission tickets are available for $175 ($75.00 tax-deductible) or VIP tickets for $250 ($150 tax-deductible). Complimentary valet parking is provided. You can purchase tickets online. 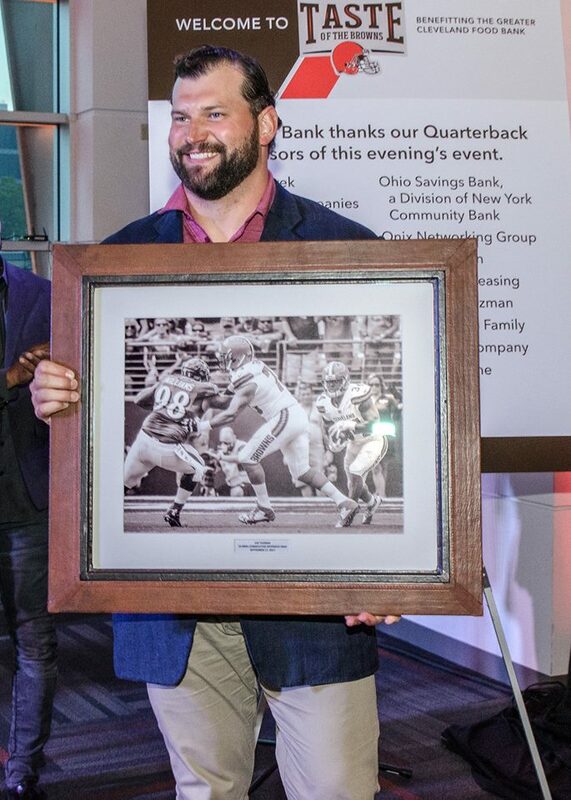 If you aren't able to attend and still want to help, you can make a donation or participate in the auction. You can also enter to win tickets by completing the tasks in the Rafflecopter below. You can also head over to my Instagram for an additional chance to win. Winner will be randomly selected. You must actually complete each step in order for the entries to count. Giveaway ends Tuesday, Sept. 18 at 8pm. Once chosen, winner must confirm attendance no later than noon on 9/19 or another winner will be selected. Winner will be required to provide their full name, guest name, email address and phone number. 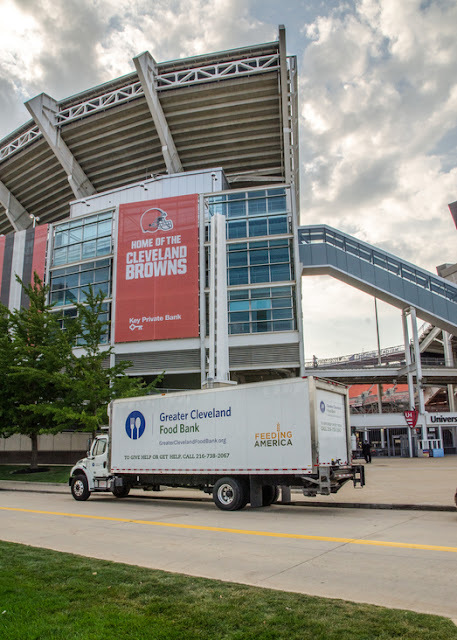 The Greater Cleveland Food Bank is also a community partner of the Cleveland Browns First and Ten movement, established in June 2014 to help inspire fans to volunteer at least 10 hours each year. In the past four years, nearly 2 million volunteering hours have been pledged in Northeast Ohio and local communities through the program. Fans are encouraged to sign the First and Ten pledge through www.clevelandbrowns.com/brownsgiveback and share their unique stories about volunteering with #give10. And just like that it feels like fall in NEO! But thankfully we still have a few weeks of summer left. I'm not ready to give up my sandals yet! But the cold snap and rain definitely got me started thinking about fall. I even made a giant pot of chili, and from all the social media posts, it seems like a lot of you did too. And I also noticed that some of you are already in full fall mode drinking pumpkin spice lattes, wearing boots, and decorating with leaves and pumpkins. Others, like me, are clinging to the last drops of summer. But whenever you are ready to dive into fall, here are some of my favorite activities. Pick one. Do them all. But make sure you take advantage of one of the best seasons in CLE. I've been going to Monroe Orchards since I was a kid. Check out Quarry Hill Orchards for their huge variety of apples too. 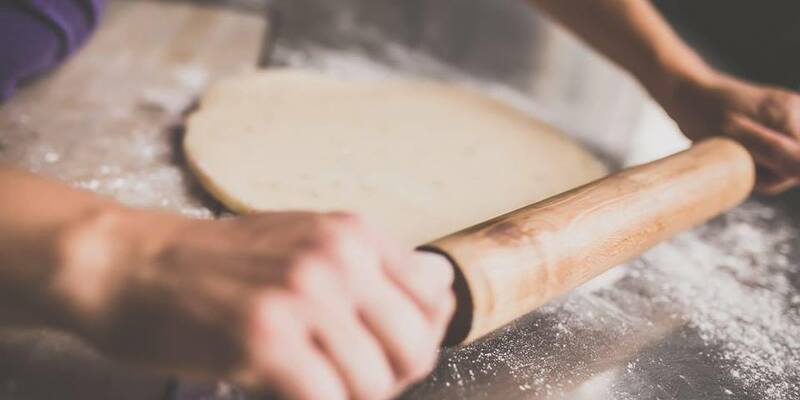 Get ready for the holidays and perfect your pie-making game. Annie's Signature Sweets has lots of delicious interactive classes that will make your pie the star of the dessert table. If sweets are your thing, you can also sign up for a pretzel making class. I'm doing just that in a few weeks and will definitely be sharing all the details. I'm a complete wimp so the fall is the only time I'll tailgate outdoors. There's nothing like gathering with 2,000 of your favorite friends in a parking lot, eating and drinking and hoping for a win. Whether you prepare a gourmet feast or just grab some snacks and beer, it's guaranteed to be a blast. If you haven't been tailgating, this is your year to change that. 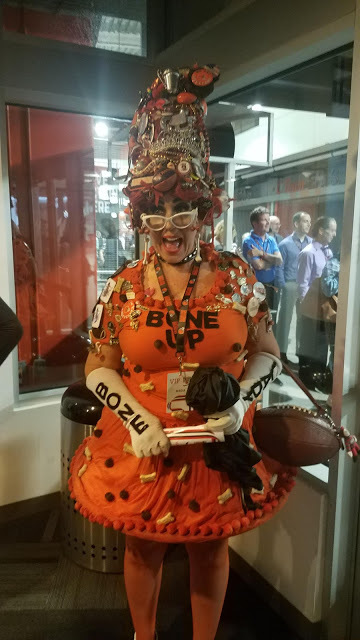 And who knows, the Browns may actually win a game this year! This is seriously one of my favorite things to do. I can't resist the lure of a campfire. We regularly have Campfire Dinner Parties so I can make as many fires as possible. Grab some hot dogs and a stick or your pie iron and dinner is served in minutes. Everything tastes better cooked over a fire. My absolute favorite is pizza pies. If you need some inspiration, check out this cookbook. On foot is the best way to enjoy the shift of the season. You can get a close up view of all the flowers, animals and trees. Plus there's nothing like the crunch of leaves under foot. Grab a blanket, linger over a picnic and soak up the crisp air and sunshine...while it lasts. 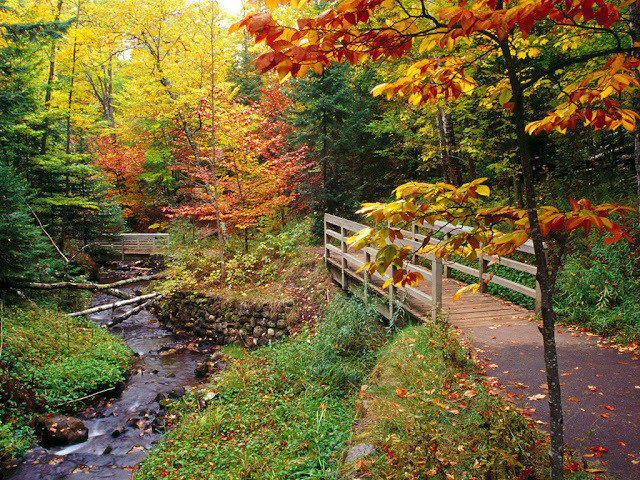 What's your favorite fall activity? Have you ever been to Butler County? If you haven't, this post will make you want to take a road trip! At just under four hours from Cleveland, it's a great place for a weekend getaway. The Butler County Visitor's Bureau invited me to visit them and get a taste of what this southern Ohio county has to offer. Traveling is my favorite thing to do. I've been all over the place - all of the States except Alaska, Maine and New Hampshire, most of western Europe, Mexico and a good chunk of eastern Canada. But the one place I haven't explored nearly enough is my home state of Ohio. Admittedly, when the Butler County Visitor's Bureau invited me to come down for a visit, I had to check the map to see where it was located. After having visited Butler County, I can honestly say I can't wait to go back! 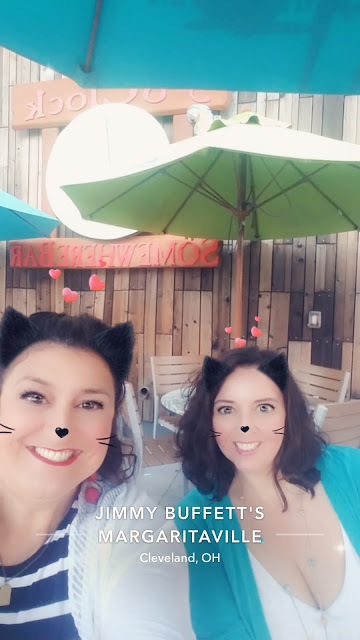 There was so much to do and see, this is post #3! 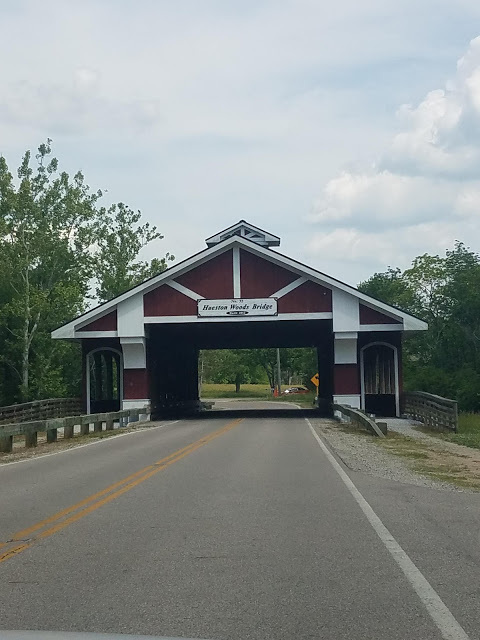 Butler County is a unique mix of urban, suburban + rural. 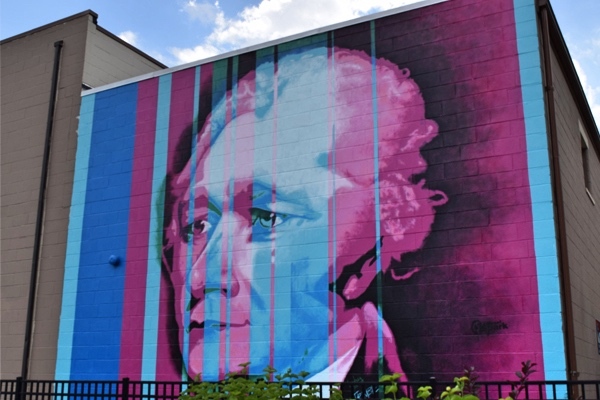 The largest communities include Hamilton, Fairfield, West Chester Township, Oxford, Middletown, Monroe and Liberty Township. We spent a long weekend driving all over and were amazed at all the fun things there are to do just a few hours from the north coast. I already told you all about the Donut Trail, but it was so much fun, I have to mention it again. 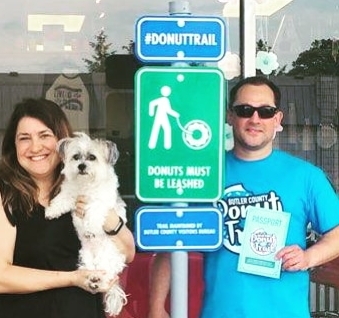 If you are a donut lover, this alone is worth the trip. But there's so much more to Butler County than donuts. And you can't talk about Butler County without mentioning Jungle Jim's. 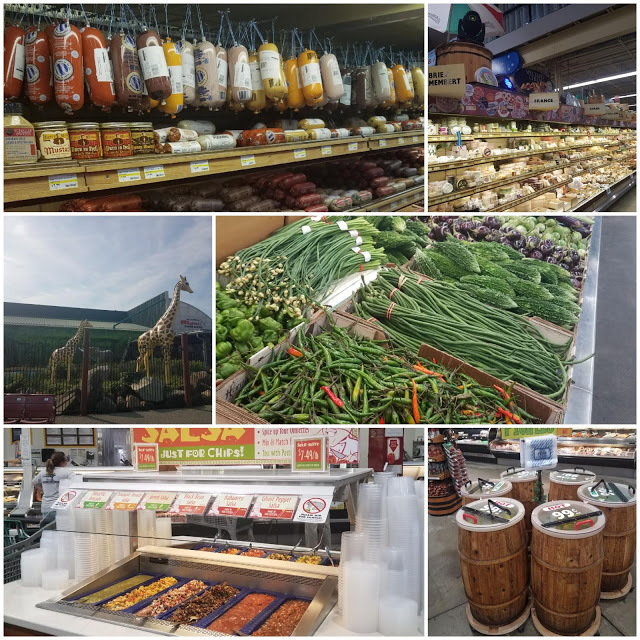 If you missed it, definitely check out my blog post about the most incredible grocery store you'll ever see. Bonus: Jimco's is affiliated with Spoken Bicycles - a really cool bike shop that has a bar inside. (Why didn't I think of this??) 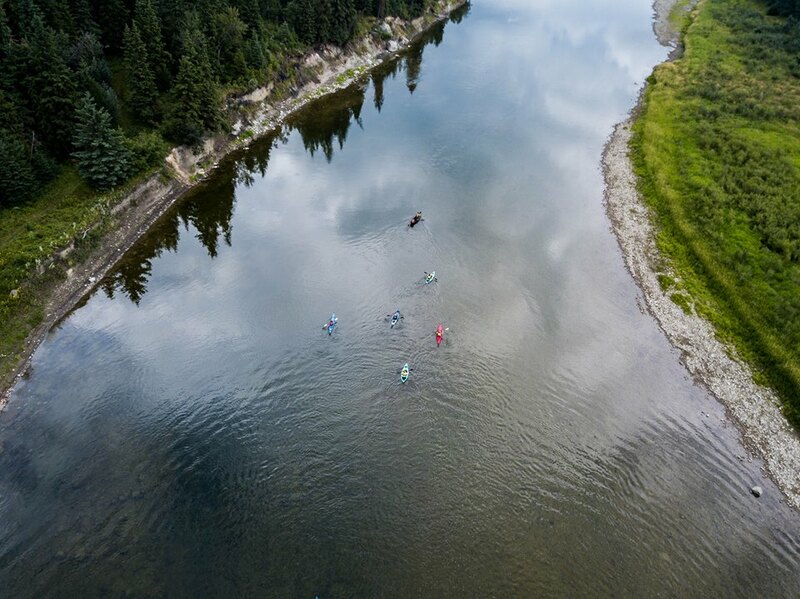 After your paddling, you can try some of their tasty craft beers or cocktails. The owners are so nice you're going to want to stay awhile. If riding is more your speed, you can also rent a bike and explore on two wheels. 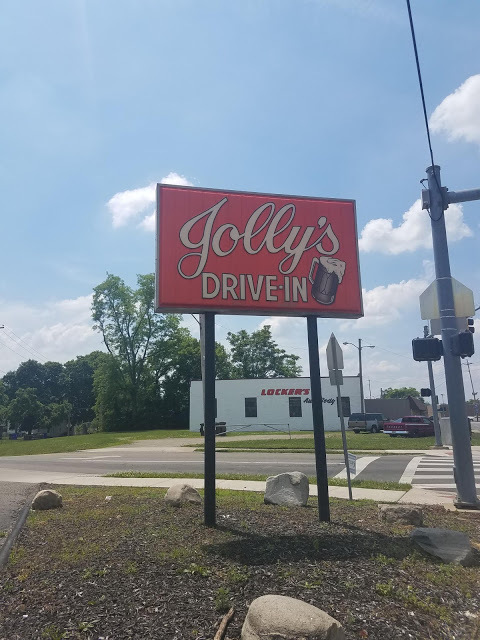 Jolly's Drive-In Jolly's is a Hamilton favorite and has been around for over 70 years. 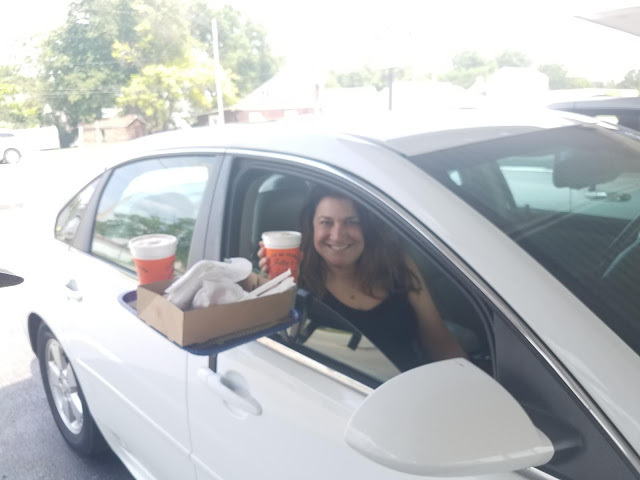 Order hot dogs, burgers, popcorn and root beer and have it delivered directly to your car. 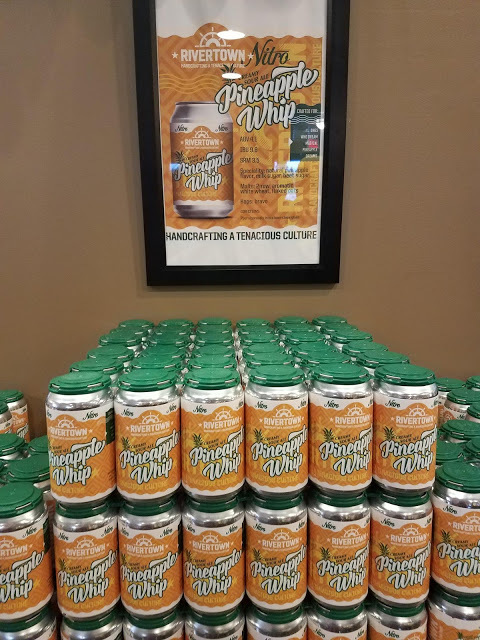 When we went to Rivertown, I was excited to find a really unique beer, Pineapple Whip Nitro. It's perfect for summer! 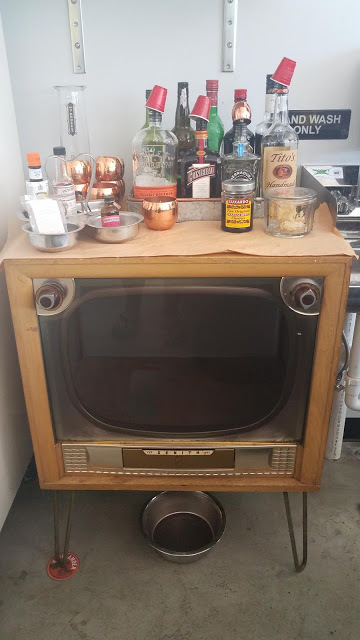 I definitely brought some home as a souvenir. 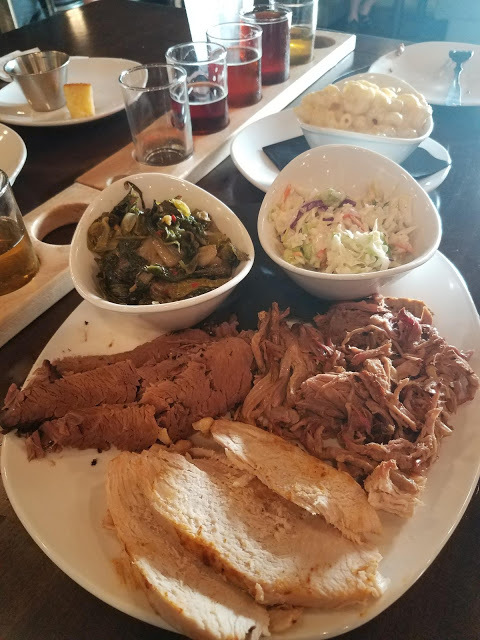 They had delicious BBQ (the turkey was our favorite) with incredible sides and lots of other tasty beers too. 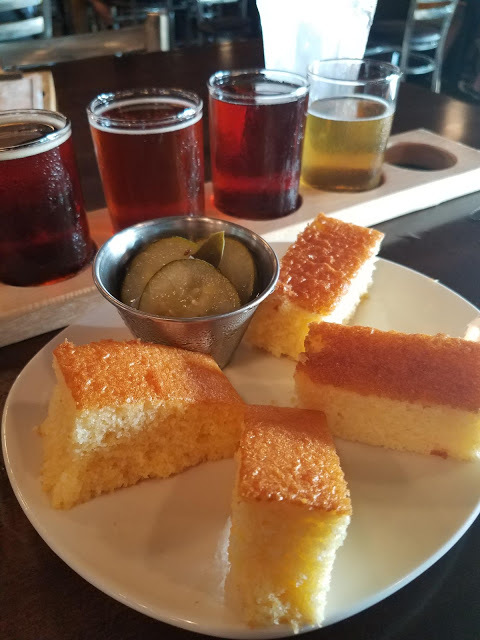 Definitely get the corn bread and lots of pickles! 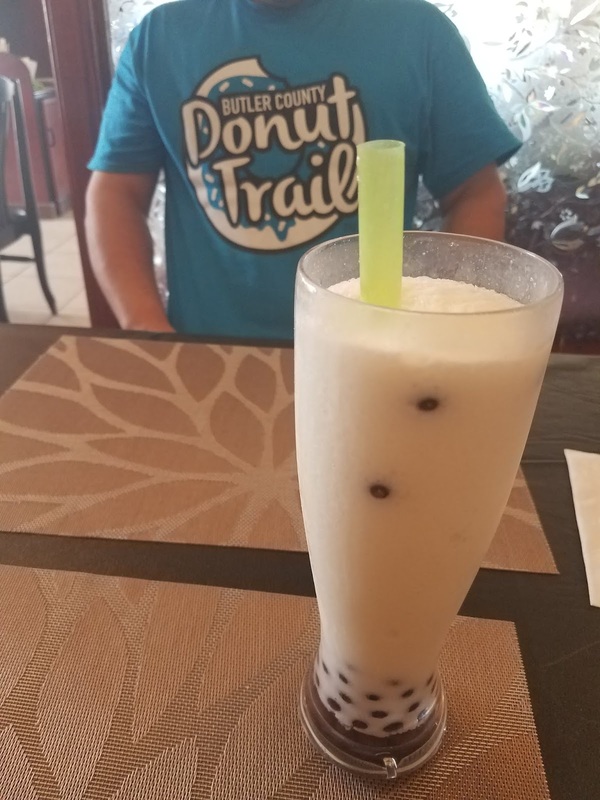 One day on the Donut Trail, we stumbled across Thai Koon and hit the jackpot! It's great Thai food in a pretty shopping area and the perfect spot to get some non-sugary eats - we had the larb and cashew chicken and both were excellent. We were so hungry I actually forgot to take photos except for the bubble tea, but trust me, it was good! 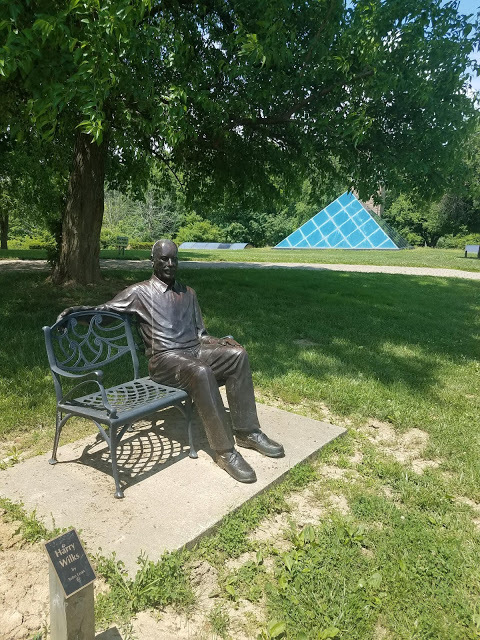 Pyramid Hill Sculpture Park and Museum is like no other place I've ever been. 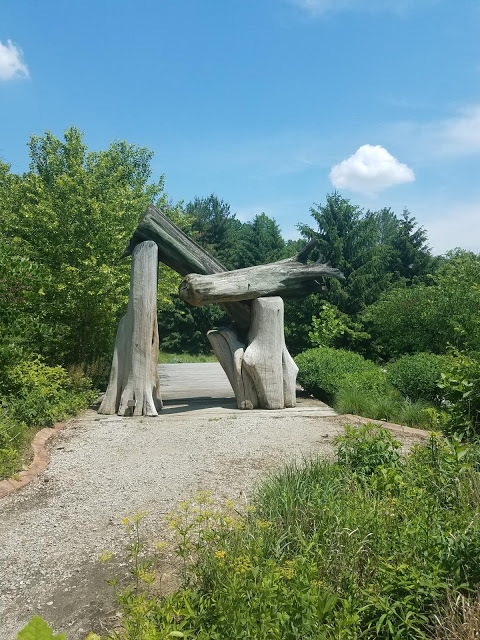 I was stunned at all of the giant sculptures in a beautiful park-like setting. You can drive around but I definitely recommend renting a golf cart...and even bringing a picnic! It was storming the first time we visited so we went back the next day. The record breaking heat and humidity kept us in our air conditioned car but I definitely want to go back when we can spend more time walking around and riding in a cart. This amazing park isn't only a summer activity - there are lots of great events year round. Art on the Hill is at the end of September and the leaves will be a gorgeous backdrop for all the other art. Don your best Halloween costume for the Zombie Ball. Pyramid Hill also has Holiday Lights on the Hill - a gorgeous holiday light display. This runs November 16, 2018 – January 1, 2019. And you can head to the Butler County Visitors Bureau website for a $2 off admission coupon. In 2004, “The American Cape,” by sculptor Kristen Vibal was installed in honor of the city's namesake. 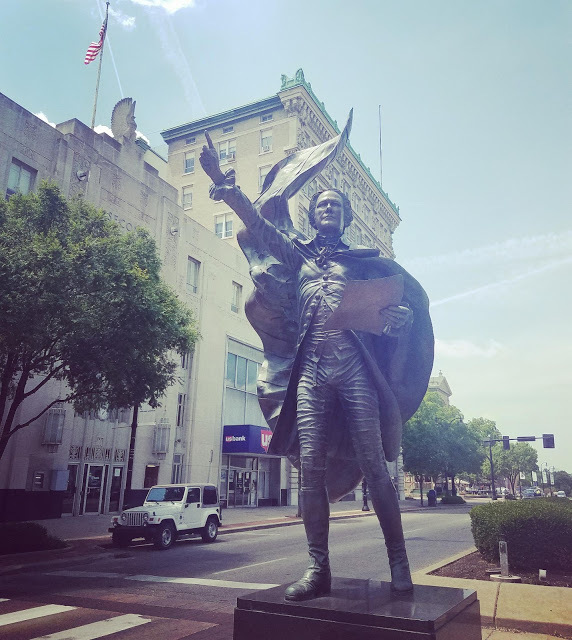 The 12 ft tall bronze Hamilton is draped in an American flag with his finger pointed to the sky. Look familiar? 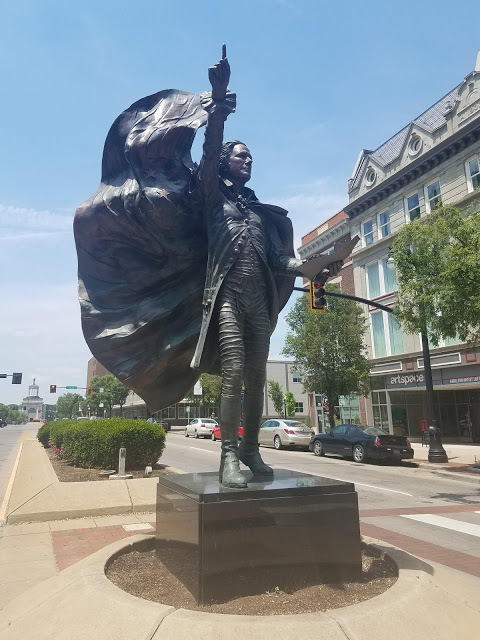 Find this fabulous statue on High Street in downtown Hamilton. 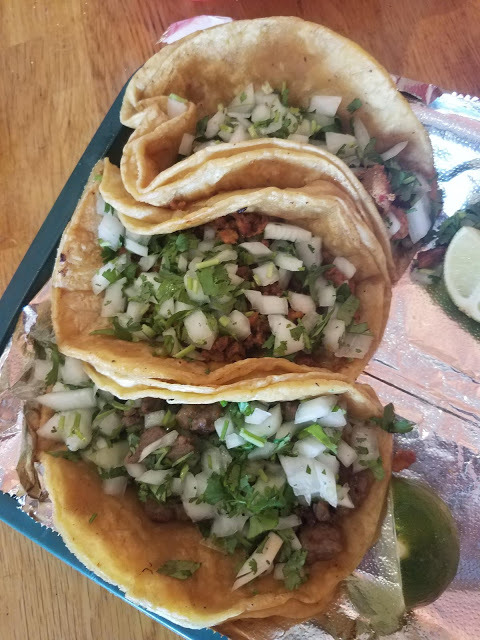 We also had some authentic Mexican food at Taqueria Guanajuato - a food truck that recently opened this quaint brick and mortar. And you can bring your furry friend with you too! 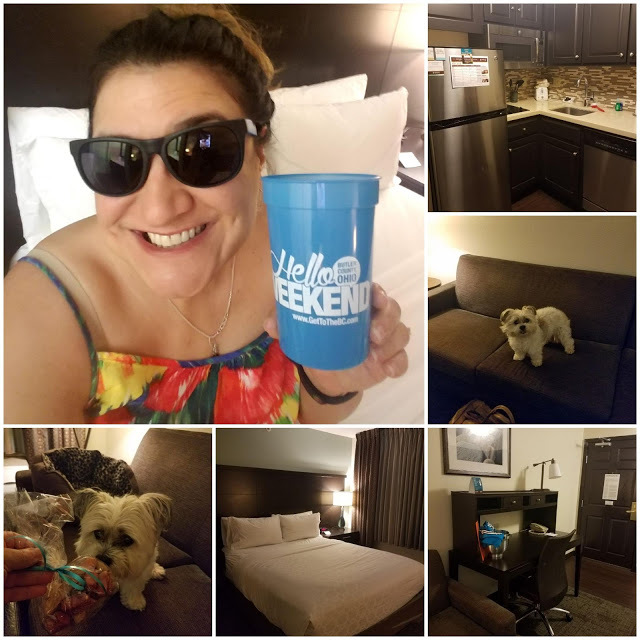 We stayed at the Staybridge Suites and we absolutely loved it! They don't tolerate your dog, they truly welcome them like family. They had a goodie bag of treats for Buffy and there were convenient grassy areas for walks and going potty. The room was spacious and clean and the location was perfect. They also have a nice pool and hot tub. I can't recommend them enough! Buffy was happy that there are lots of other dog friendly places in Butler County. 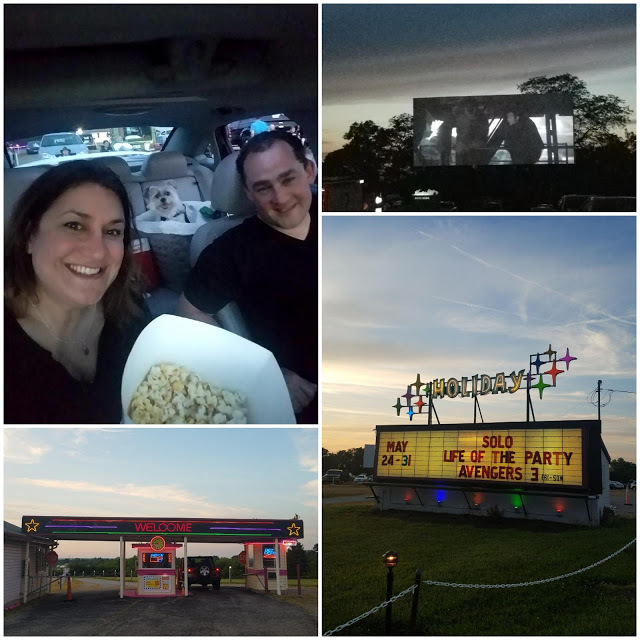 Buffy went to Holiday Drive-In, Jolly's, Pyramid Hill and The Cone (the soft serve was SO good!) with us. We were in Butler County for the weekend and we didn't come close to seeing all the cool stuff it has to offer! Some other things that are on our list for next time, because we're definitely planning another trip! 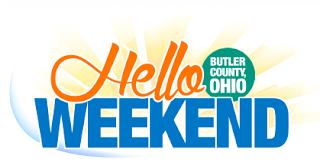 The Butler County Tourism Bureau website is a great resource when you plan your trip. You can sign up for their newsletter, or follow them on Facebook, Instagram or Twitter. 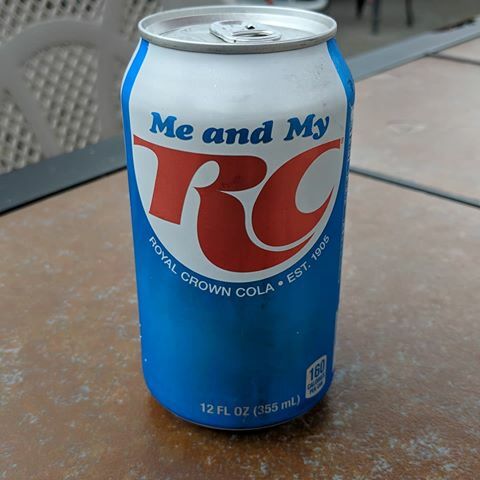 #GetToTheBC! This post is sponsored by the Butler County Visitor's Bureau. As always, the thoughts an opinions are my own. Homemade Lemon Curd...in a Vitamix!